I joined Equality Florida as a Public Policy Intern this May hoping, like so many people from my generation, to do something meaningful during my time as a student at Rollins College. Taking my first steps through the rainbow-draped door of our small Orlando office, I had no idea what this summer had in store for me or my new team. As a gay woman who has had the privilege of calling Orlando my home for the past two years and Florida my home for the past 20, interning with Equality Florida seemed a natural progression of my love for the LGBTQ community and my desire to create positive change in my state. During my first month I jumped in head first: attending town halls, traveling to Prides throughout Florida, and speaking to countless people who showed the incredible trust and courage it takes to share one’s story with a virtual stranger. Then, exactly a month after my first day, 49 people lost their lives in the shooting at Pulse Nightclub on June 12. The change was sudden and profound. Deeply personal messages poured into Equality Florida’s Facebook account by the hundreds. I read the taglines of messages I felt helpless to respond to — outpourings of grief, of support, of loss. We grew by thousands of Facebook followers a day during the first week after the shooting, and I saw Equality Florida’s name broadcast on news stations around the world. What was initially a statewide organization grew to an internationally recognized civil rights group overnight, as the LGBTQ community and people across the country grappled with how to react to an unparalleled act of gun violence and hate. Although I had already been passionately invested in Equality Florida’s mission, it was ultimately the response of the community in the face of such devastating loss that revealed to me how essential activist organizations are as platforms for change and healing. The contrast between the incredible displays of strength, support, and generosity I witnessed on a local level and the gross inaction and meaningless platitudes I heard from so many politicians was staggering. It opened my eyes to a truth I’d never fully been able to see — meaningful change has to happen from the ground up. It starts with communities coming together, stories being shared, and friends and neighbors having the courage to take a stand for one another. It is this courage that led me to join a group of activists and civilians who gathered together on Monday to stage a 49-hour sit-in at U.S. Senator Marco Rubio’s office in Orlando, in memory of the 49 people who lost their lives that night at Pulse. We all had our own stories of how gun violence, brutality, or discrimination had impacted our lives and loved ones. We gathered to express our deep frustration, anger, and disappointment in politicians like Senator Rubio who offered their empty sympathies yet refused to do anything to stop the continued violence and death. We shared stories, songs, and a mutual belief that our presence could make a difference. We refused to move just as Rubio and others have continued to refuse to acknowledge or work toward ending this cycle of oppression and violence. That night, ten people who had so quickly become my friends were arrested for standing up and sitting in, and sacrificed their comfort and safety to express their solidarity with all those who have been victims of gun violence and discrimination. 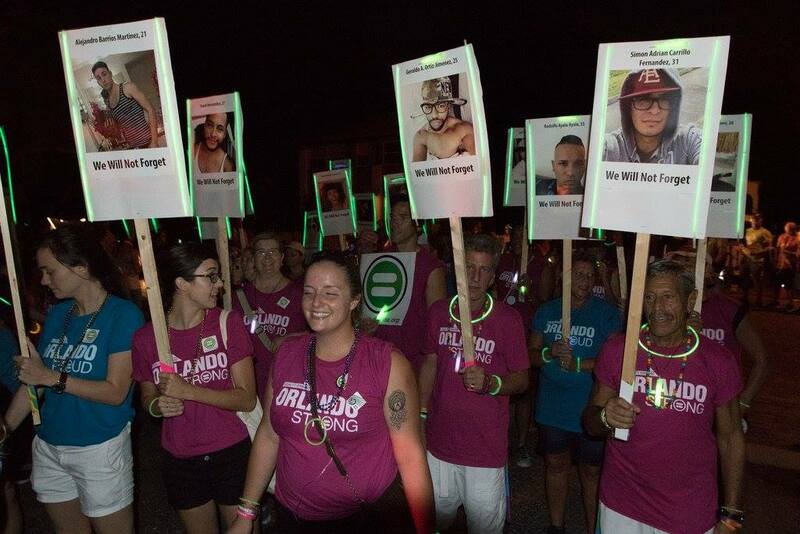 They walked out of jail yesterday morning, July 12, exactly one month after the shooting at Pulse Nightclub took place, squinting into the sunlight that 49 people will never see again. My few months as an intern for Equality Florida have completely changed the way I understand and move through the world. I have seen the people around me struggle to keep fighting for justice under the weight of a grief we haven’t yet had time to process. I’ve met so many people who have suffered profoundly as a result of the way this country continues to denigrate LGBTQ, Latinx, and Black lives. I’ve also seen change enacted through grassroots organizing and community solidarity in a way I never thought was possible. The raw hope this experience continues to bring me is a powerful combatant to the loss and violence our communities are subjected to every day. In the face of so much tragedy, we must bravely continue to raise our voices for the 49 who lost their voices forever at on June 12, and for all those who continue to lose their lives to gun violence at a staggering rate. Equality Florida has instilled in me a powerful belief that change is possible, so long as we fight. And if there’s one thing I’ve realized about our community in these past months, it’s that we will never stop fighting.